One of my absolute dream wish list handbags is of course the Chloe Drew, probably the most coveted and Instagrammed designer bag of 2015. I’d have to win the lottery to have any chance of owning one any time soon, so instead I have to settle for the various high street versions that come with a much more affordable price tag. I love the easy style aesthetic and functionality of saddle bags, and I have Topshop’s current copy of the Drew in both black and tan. 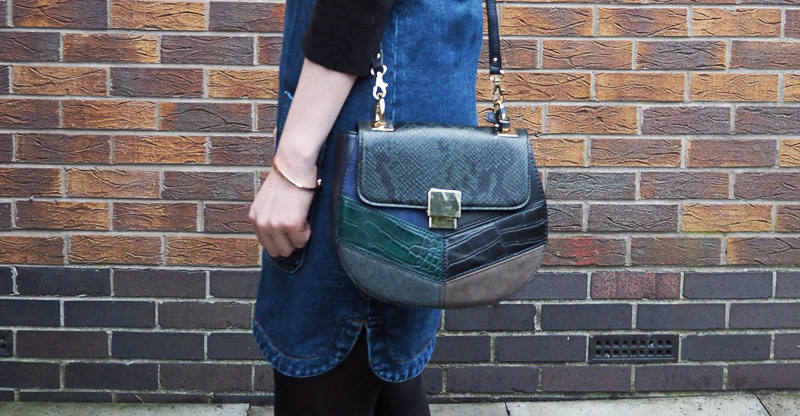 Earlier this year, Chloe brought out a ridiculously gorgeous patchwork python version of their new ‘It bag’ and I was desperately lusting after it. So, when I saw this patchwork Aldo saddle bag I had to have it. It gives the perfect 70s influence to my outfits and the patchwork pattern adds style and personality without being too over powering. With the right mix of modern and retro due to its classic shape and chic gold hardware, it truly is a great bag. What really appealed to me was that it has the ability to work with different styles. It would look as amazing worn effortlessly with jeans and a plain white tee as with a pretty printed dress. The styling possibilities are endless. For this outfit, I wanted the bag to be the focus of the look and so kept it casual. 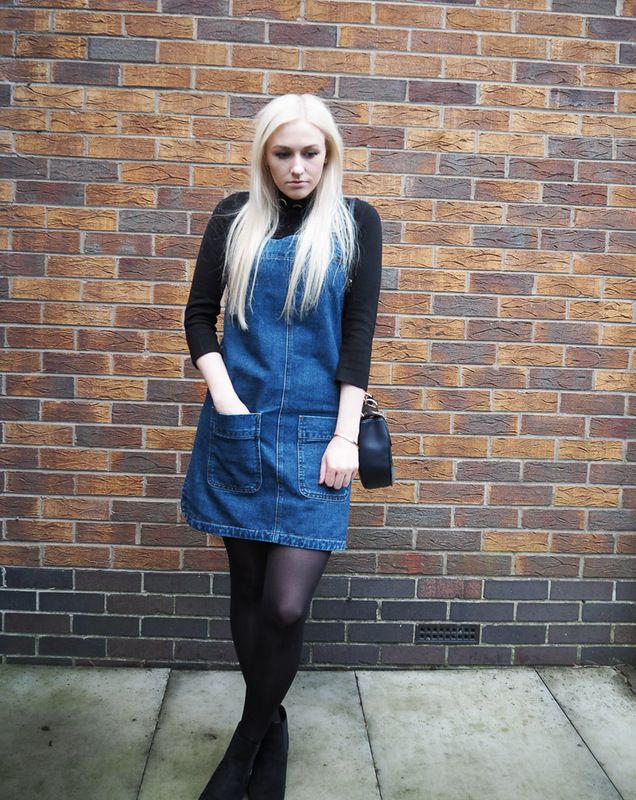 This denim pinafore is still a favourite of mine. 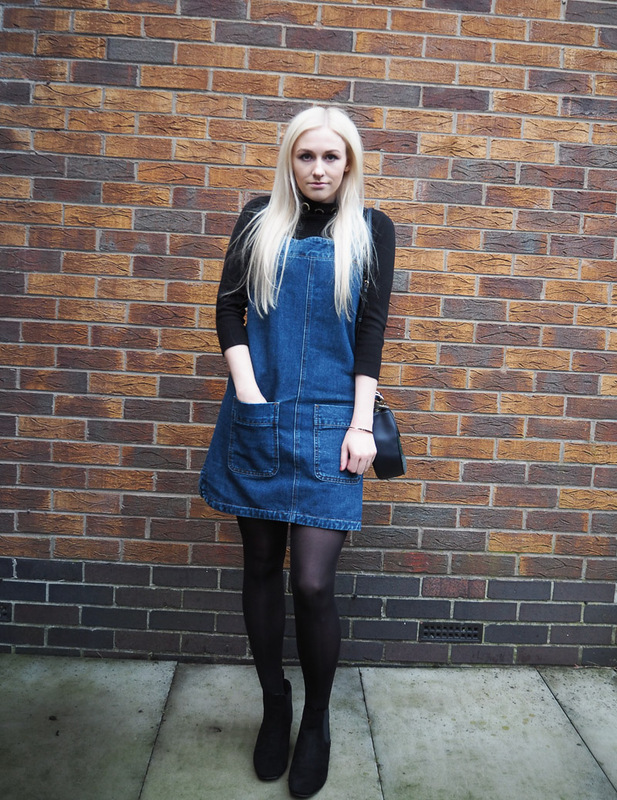 I’ve worn it so much since I got it; it’s basically become my denim go to in place of jeans. I’m also wearing my black turtle neck with eyelets at the neckline. I usually wear this top with skirts but I’m really liking it under this pinafore. It adds some detail to my simple look whilst not taking the spotlight away from the statement making bag. 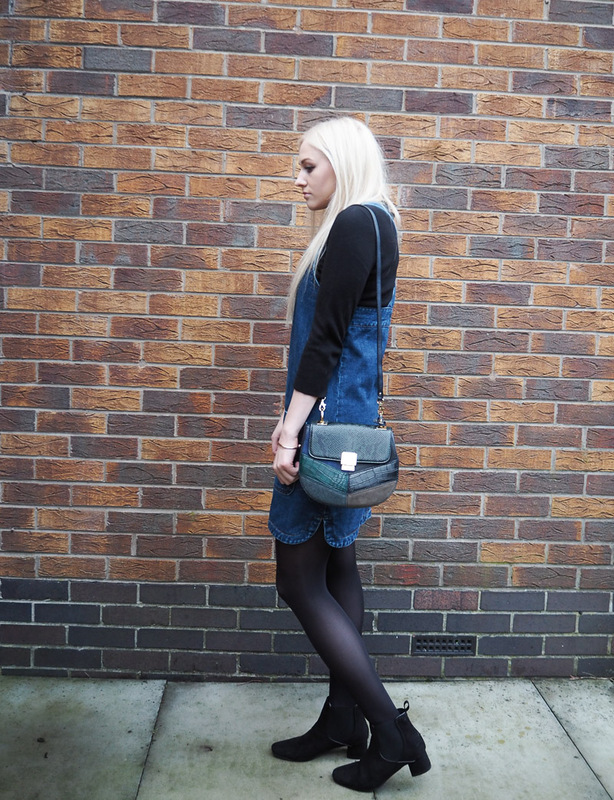 My black suede ankle boots are a 60s style, a trend this season that I’ve loved. They have a low heel which makes them completely wearable for me during day time. The 60s are a favourite style decade of mine, along with the 70s. It’s been very beneficial for my wardrobe having both eras be so popular for designers and the high street in the last year. These boots are just adorable and add a stylish retro vibe to any outfit. They work so well with my wardrobe of primarily dresses and skirts and compliment my personal style.